In fact, “Sender” is called “SMTP account” in our scheduling email sending products. Because the normal users may don’t understand what is SMTP (Simple Mail Transfer Protocol), and SMTP are supported by most email providers, so, called it as “Sender” is appropriate. You can also understand it as “eMail account”. Follow this sense, the “popular sender” means that the email services which are used by many people. Such as Gmail, Hotmail and Outlook.com. Why need this feature in our scheduling email sending products? Reduce your workload - do not need to input the common settings for your email account in our task scheduler send email program, such as server, port, connection protocol, if needs authentication, etc. Standardize the SMTP settings for the popular email providers, in order to keep them up-to-date as the official settings. Most important: you may do not know the settings of your email account, with this feature, you no longer need to read the official help, ask someone, Google or guess for the SMTP settings. For above reason, this feature is very friendly for you. How to enjoy it in our delaying sending email software? 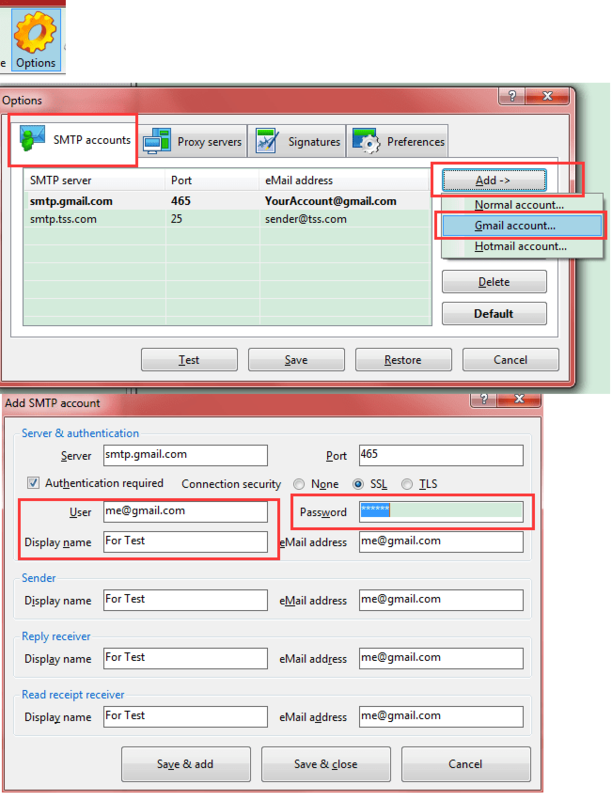 Screenshot: to delay sending email, you must create a SMTP account first. Now, our task scheduler send email programs support to create Gmail (also support your enterprise email with set in Google App) and Hotmail (also support other Microsoft email accounts, such as @outlook.com) directly. Download Our Task Scheduler Send eMail Application to Delay Sending eMails!